This simple guide to calligraphy teaches just the basics, allowing novices to jump right in and make their own wedding invitations, hand-label envelopes, write their own placecards, and explore their creative side. I have always found calligraphy elegant and pretty. 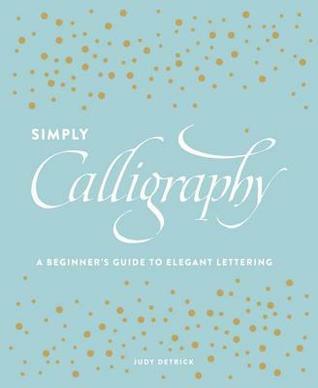 There seems to be a lot you can do once you know how to write this way and this book is perfect for beginners!! It starts with down strokes and lines and works up to bigger letters and writing. This book is set up nicely and makes it easy to understand and practice. I wasn't overwhelmed by too much at once, which can happen with books like this. I received this book from Blogging For Books for free in exchange for an honest review.